We all know how we each care about the location attributes of where we find ourselves living. We may be, currently, thousands of years down the line since our ancestors began to walk on two legs rather then four, but we all continue to seek shelter, food and water, and safety from harm. We grow out from our birth family and seek our own shelter as adults, intending to settle and maybe stay close to our extended family and/or move away and become part of another group or bigger community. Various groups of early humans seem to have done that, thus expanding the migratory, nomadic and exploratory behaviour of human temperament. Whether we are nomadic or settled, we arrive at a place and we utilise the environment to extract what we need to live each day. We look for plenty of water, food sources, places to set up home. This is what it meant to be human thousands of years ago, and this is what it still means today. All wild creatures have an acute sense of danger, and their existence depends on them being alert and wary of other predators. Human existence has obviously evolved to try and avoid death from more powerful animals, poisonous substances, high risk environments. This has always been a major challenge, as it has been for all non extinct present day creatures who inhabit this planet. Early humans must have noticed how quickly the flesh fell away from dead things and left bones. These bones varied in size. Small bones could be used for delicate workings, big bones as weapons to kill or defend. To break a bone by smashing it with something very heavy, like a heavy rock, would reveal healthy marrow inside the bone to eat, which was highly nourishing. So the reward for using a tool, in this case a heavy stone, to break a strong bone, and find nourishment from marrow within the bone, will have been a first stage of understanding tool use. Chimps will use sticks to reach for food difficult to obtain, such as a food within a hollow of a tree. Utilising material found in the immediate environment as a tool was already part of the ancestral tree before it branched off to the human branch. Where areas of the earth were not glaciated, in some places there were forests. Different trees had different attributes, bushes and tall grasses all could be used. Much of the knowledge of edible and poisonous berries and roots would have been known since way back in our branch of chimp ancestry. One day we came to understand how to make fire. This could be used to warm us, eventually to heat food, to brandish at threatening predators, to one day use to forge tools. The Paleolithic era extends from the earliest known use of stone tools, probably by Homo habilis (see below how ‘handy man’ was so named) initially, 2.6 million years ago, to the end of the Pleistocene around 10,000 BP. It is estimated that 1 million humans were on the earth around 10,000 BP. We find evidence across the world of pockets of early humans developing the ability over time to make tools, and apply them, in an increasingly sophisticated way. These were tools for making and creating useful everyday things, for scavenging more effectively to expand dietary choices. The rise in weapon standards for hunting and killing proved to be a necessary step to survive and cope with predators. I have put together a list here of selected significant discoveries from Africa, to Europe to the Americas since upright man (Homo erectus) and handy man (Homo habilis). The stage of development of our ancient ancestor, known as “upright man,” when walking on two legs instead of four, marked a new and useful stage of modern humans. The dating of bones of such ancestors has revealed they lived from 2 million years ago till about 100,000 years ago, possibly even 50,000 years ago. Their fossilised remains have been found across the globe, including South Africa, Kenya, Spain, China, and Java (Indonesia). The early evolved “handy man” who made tools emerged in this same Pleistocene era. 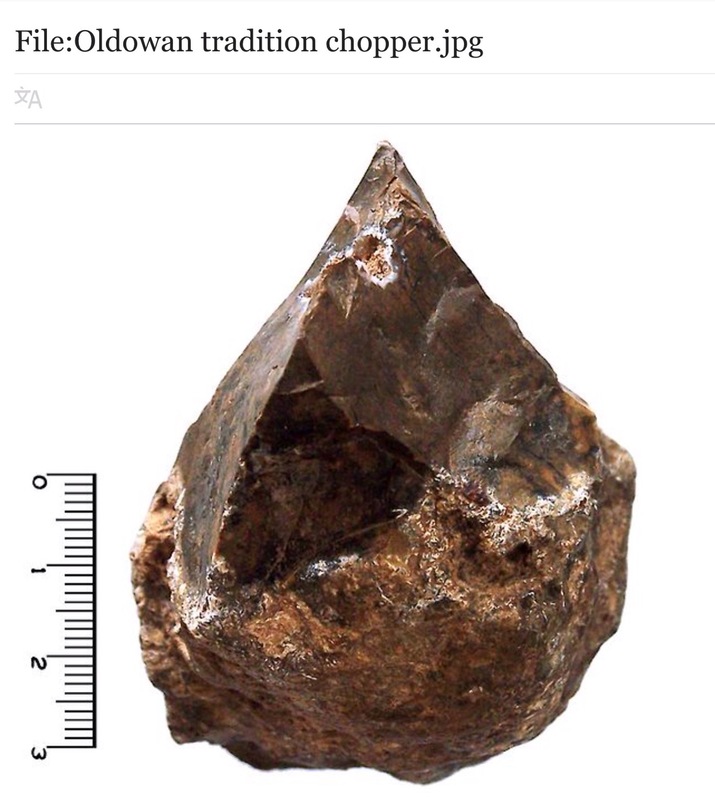 2.5 million years: Oldowan stone tools eg. Tanzania ancestor stage, Homo habilis. Used lava and quartz, which was the only form of stone available. 1 million years: stone tools, Tanzania. Used Lava and Quartz. 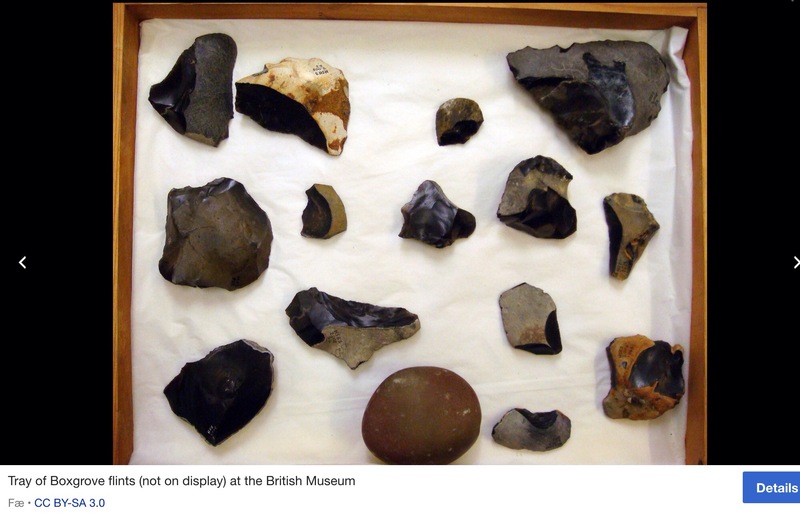 800,000 years: stone tools Happisburgh, England. Used Flint. 500,000 years: stone tools found with early human fossilised remains in Boxgrove, W.Sussex. Used Flint. 300,000 Neanderthals arrived in France, no doubt by watercraft (a vital tool). 40,000 years: Migration of early humans arrive in Australia, most probably form Africa via Indonesia to islands in the Pacific region via land bridges where they arose. The following terminology simply describes an early part of human tool industry, a vital indicator of their means of survival. Very early Acheulean stone tools occur across most of Africa, except in rainforest regions. These tools have also been found throughout Eurasia, in more recent deposits south of the regions of Pleistocene glaciation. In Asia, they are known from Turkey, Iran, Pakistan, India, and southeast Asia. In Europe, they reached as far north as the Danube and, further west, are known from France (where tools of this industry were first recognized), as well as the lower Rhine valley and southern Britain. Further north, glaciers prevented human occupation. When the Leakey family began doggedly searching the Olduvai Gorge, or Oldupai Gorge, in the Great Rift Valley in Tanzania, (see https://www.tripadvisor.co.uk/Attraction_Review-g293751-d480292-Reviews-Olduvai_Gorge-Serengeti_National_Park.html). The Leakey family were rewarded for their decades of hard work in finding ‘the origins of man’. They chose to search this steep sided ravine stretching across East Africa. It is about 48 km (30 mi) long, and is located in the eastern Serengeti Plains in the Arusha Region not far, about 45 kilometres (28 miles), from Laetoli. Today these rifts and faults are seen as distinct, although connected. These were only formed 35 million years ago. Tanzania (/ˌtænzəˈniːə/),officially the United Republic of Tanzania (Swahili: Jamhuri ya Muungano wa Tanzania), is a sovereign state in eastern Africa within the African Great Lakes region. It borders Kenya and Uganda to the north; Rwanda, Burundi, and the Democratic Republic of the Congo to the west; Zambia, Malawi, and Mozambique to the south; and the Indian Ocean to the east. Mount Kilimanjaro, Africa’s highest mountain, is in north-eastern Tanzania. Some prehistoric population migrations into Tanzania include Southern Cushitic speakers who moved south from Ethiopia; Eastern Cushitic people who moved into Tanzania from north of Lake Turkana about 2,000 and 4,000 years ago; and the Southern Nilotes, including the Datoog, who originated from the present-day South Sudan-Ethiopia border region between 2,900 and 2,400 years ago. These movements took place at about the same time as the settlement of the Mashariki Bantu from West Africain the Lake Victoria and Lake Tanganyika areas. They subsequently migrated across the rest of Tanzania between 2,300 and 1,700 years ago. Lava and quartz were used to make tools in Olduvai Gorge. Only in the period 1.65 to 1.53 ma was chert (Flint) used, and it presents a significant difference in appearance among the assemblages of Olduvai Gorge. The archaeologist Pat Shipman provided evidence that scavenging was probably the more common practice; she published that the majority of carnivore teeth marks came before the cut marks. Another finding by Shipman at FLK-Zinj is that many of the wildebeest bones found there are over-represented by adult and male bones; and this may indicate that hominins were systematically hunting these animals as well as scavenging them. The issue of hunting versus gathering at Olduvai Gorge is still a controversial one. Mary Leakey and son Jonathan found a small form of hominin that they called Homo habilis, translated as “handy human,” because it seemed he was able to use tools. This fossil was dated at about 2 million years old. This was confirmed when another son, Richard, discovered another Homo habilis in 1972. The oldest definitive stone tools were found in the Gorge and date to 2.6 million years ago. 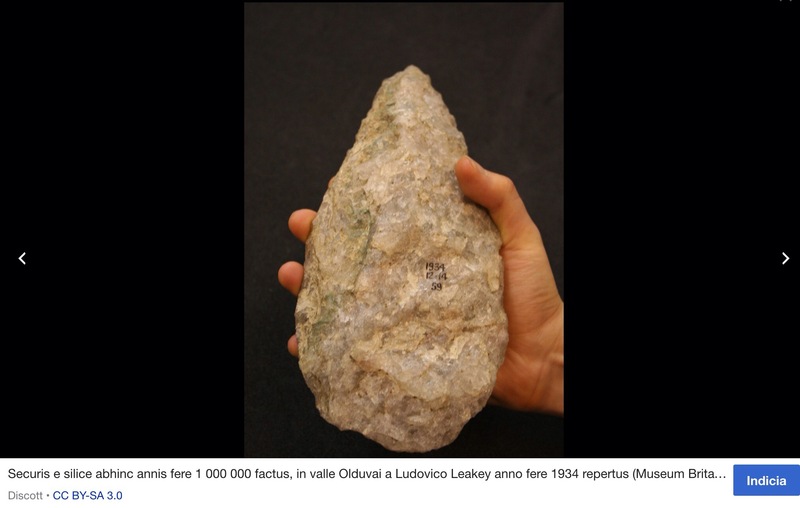 Since the Leakey expedition, more recent discoveries of stone tools have been revealed by searching the Olduvai Gorge. Under the organizational umbrella of the Olduvai Geochronology Archaeology Project, an international team of scientists composed of a consortium of researchers and institutions have an ongoing study underway. 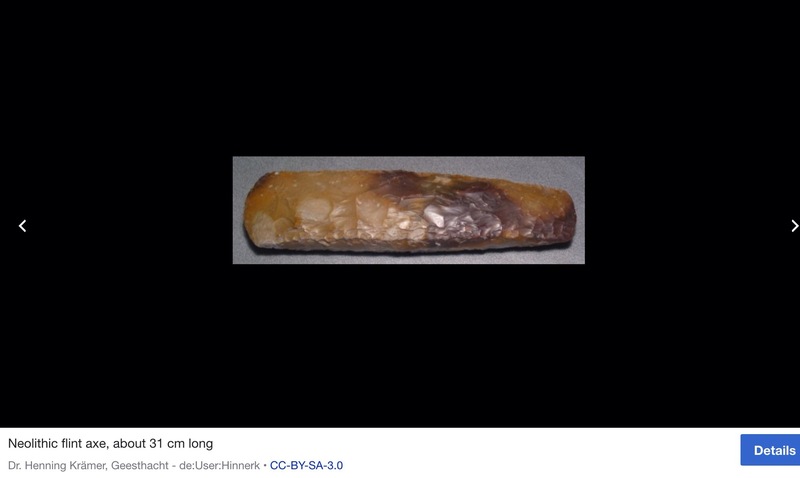 Image of a large stone tool shown below is estimated to be 1 million years old. Flint is generally considered the stone material of choice for early man, however this stone is only found in specific geological areas and so was one of mainly types of stone used through prehistory. Flint is a hard, sedimentary cryptocrystalline form of the mineral quartz, categorized as a variety of chert. It occurs chiefly as nodules and masses in sedimentary rocks, such as chalks and limestones. Certain types of flint, such as that from the south coast of England, contain trapped fossilised marine flora. Pieces of coral and vegetation have been found preserved like amber inside the flint. Thin slices of the stone often reveal this effect. This year (2017) a find in Morocco at the Jebel Irhoud site in Morocco located stone tools. These appear to date to the early Middle Stone Age, an ancient cultural stage in the north, east, and south of Africa that began around 280,000 years ago. At the site, fragments of burned flint suggested that humans used fire intensely there. The Neanderthals are thought to have arrived there around 300,000 BC, but seem to have died out by about by 30,000 – they are likely to have bred with the hominins they met in the region. We also know the Neanderthals were seafaring and they probably set off to find warmer climates. But the Stone Age skills will have evolved and been added to their arsenal of abilities. Evidence of cannibalism among Neanderthals was found in Neanderthal settlements Moula-Guercy and Les Pradelles. Cannibalism appears throughout human history, and perhaps was a genetic trait carried on, since we all possess some Neanderthal genes. 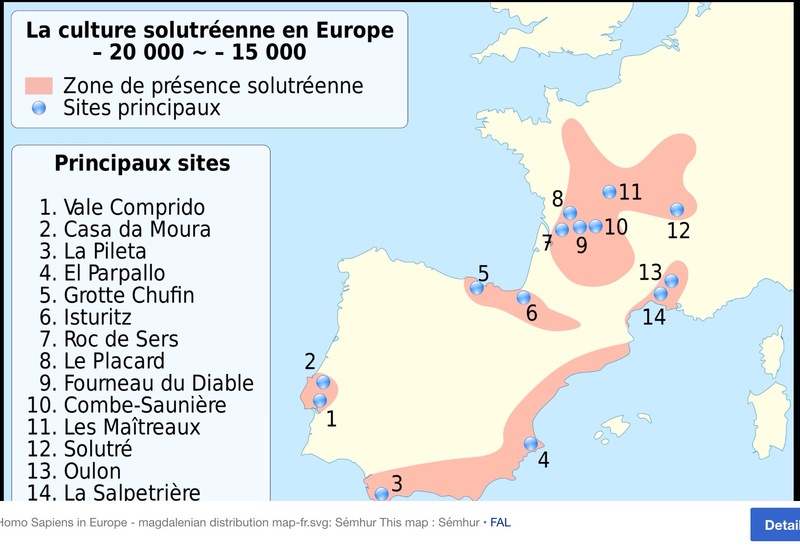 Towards the end of the Palaeolithic period, around 21,000 years ago, humans living in what is now France and Spain, developed a very finely crafted and technically sophisticated lithic technology, referred to as the Solutrean industry (from the type site in the Solutrè region of eastern France). The people who developed this new technology were probably the same people who executed the beautiful cave paintings at Altamira and Lascaux (right) and other cave sites that also date from the Upper Palaeolithic. Their innovations are thus seen as part of the first flowering of human artistic expression that has survived. 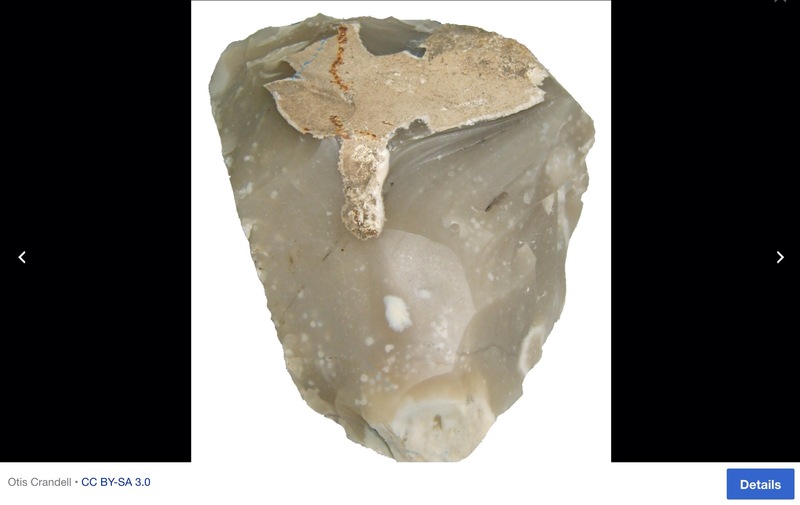 Although humans had been making finely flaked bifaces (“hand axes”) of the Acheulian type for hundreds of thousands of years, the new Solutrean flint technology was far superior to anything that had been seen before. 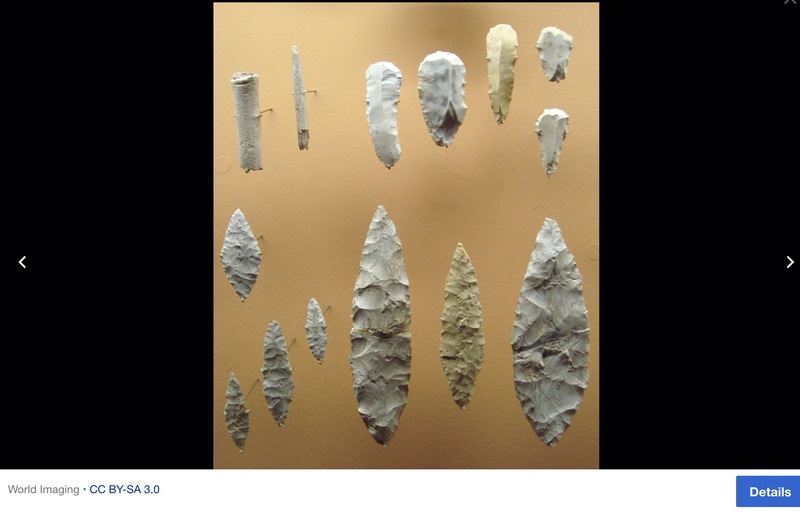 Many of the implements produced were arrow heads and spear points, usually leaf shaped, and exceptionally thin in cross section. These finely produced spear heads are unlike other prehistoric tools found globally. There is indirect evidence for Paleolithic ocean travel, perhaps to the Americas. Although no boats have been found, we now know that by at least 40,000 years ago, watercraft carried a founding population to Australia. By 28,000 years ago, flintknappers were collecting raw materials from islands far off the Japanese coast. And closer to Spain, Paleolithic peoples inhabited some of the Mediterranean islands at least 14,000 years ago. (see Dennis Stanford, an anthropologist with The Smithsonian Institution and Bruce Bradley, an archaeologist with University of Exeter, put forward this theory in a paper published in World Archaeology in 2004 and, in expanded form, in their book ‘Across Atlantic Ice’ (2012). Four wooden spears made around 400,000 years ago were found in Schöningen in Germany. The 2m spears were found in soil whose acids had been neutralised by a high concentration of chalk near the coal pit. Such spears (made of yew or spruce) would have been thrusting weapons not javelins, due to their poor piercing power as a projectile so would have required the hunters to ambush their prey. This was the likely scenario are Schoningen where (based on environmental data) the hunters would have been hiding in reeds around a large lake waiting for a group of wild horses who they ambushed. 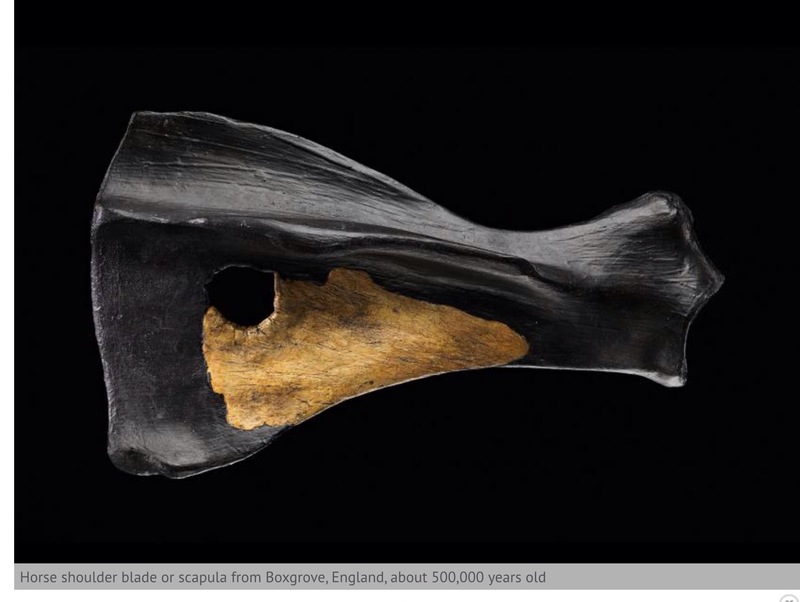 Boxgrove (UK) gives further evidence of spear use for hunting large fauna, here a horse scapula was found with what appears to be a hole from a fire hardened spear. Boxgrove is one of the best, if not the best, site where a fossilised early human remains have been discovered and many stone tools from 500,000 years ago. 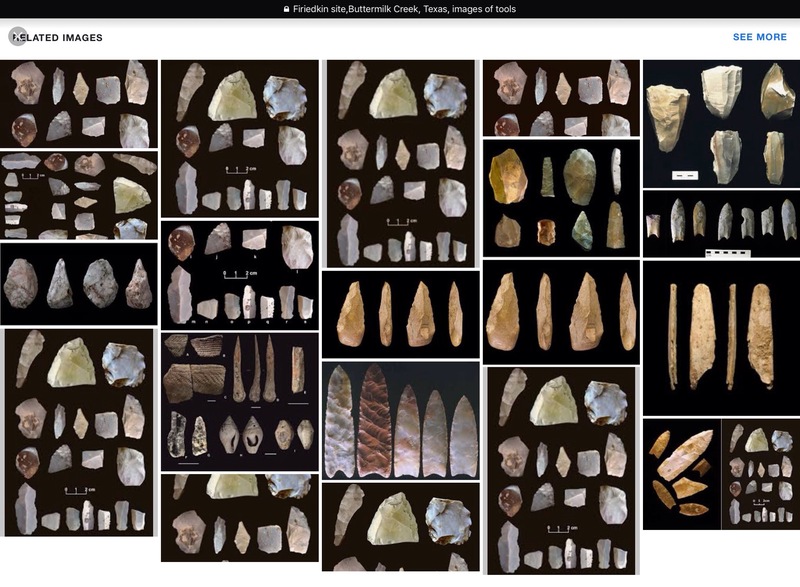 Many exciting PreClovis sites are being discovered over the Americas. These all show later Pleistocene hominins existence in the Americas. There are theories as to how they arrived, and whether their nomadic life included leaving by some watercraft, perhaps finding sources of food to take to other locations. Buttermilk Creek, Texas – Unknown to many, but placed on the map in early 2011 when Texas A&M University anthropologist Michael Waters, plus his team, painstakingly excavated an archaeological site, known as the Debra L. Friedkin site, for years. They found 15,528 artifacts at the Buttermilk Creek Complex, as researchers are now calling the assemblage, which contained evidence of small blades, choppers and scrapers. From my perspective, this all looks like it took around million years to evolve from Oldowan to Archeulian tools. 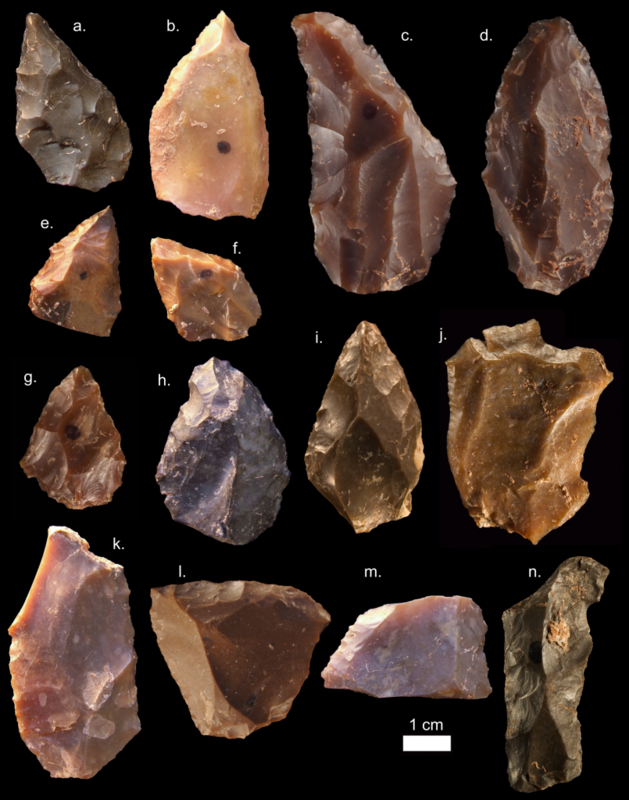 Thereafter, the incremental improvement in skills, highlighted in the amazing French (and Spanish examples, not detailed here) reveal tens of thousands of years to create more sophisticated artefacts until the late Pleistocene. We then note high sophistication of the Solutreans, but less sophistication in those groups living far away on another continent, the Americas. To be able to live in one geographical area and build a population who can pass on skills to their descendants seems to be the striking key to progress in the Iberian Peninsula and France. This may be linked to the Moroccan site of recent interest. Perhaps some Neanderthals when they were in France, sailed back to Africa, having begun their travels in East Africa, thousands of years before, taking with them the stages of skill developed whilst visitors to France. We can all have opinions on this, given the findings presented so far. I look forward to more pieces of this exciting jigsaw being made available for us to imagine our ancestral routes and value this Planet which has provided for us since our inception. This entry was posted in Uncategorized and tagged Africa, Americas, england, flint, france, homo erectus, homo habilis, Leakey, pleistocene, solutrean, stone tools, wood. Bookmark the permalink.